In our CHL and defensive handgun classes, we teach our students to carry a backup magazine for their pistols or speedloader for their revolvers. Yet I have personally struggled with an effective way to do this. All the belt-mounted magazine pouches I’ve tried stick out too much to conceal on my frame. I’ve resorted to carrying an extra magazine in a canvas knife holder in my pants pocket on the support side. It’s not comfortable and it certainly wouldn’t be easy to get to in the heat of battle. During my drills, I pull the magazine out of my pocket when drawing my pistol, but it’s still in a velcro-fastened carrier and it’s interfering somewhat with my shooter’s grip. Thanks to Crossbreed Holsters, makers of my favorite IWB (inside the waistband) holster, I now have the answer that works for me. 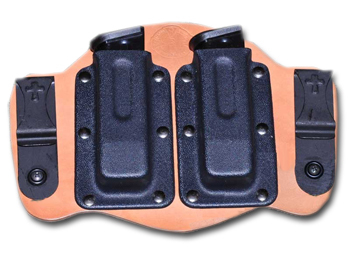 It’s their IWB mag holder, available in both one and two magazine models, molded to fit the size magazines you carry. The one I ordered works great with my double-stack magazines in either 9mm or 40 S&W. It doesn’t fit the double-stack 45s for my Springfield XD. I’m happy, though, because my normal daily carry gun is the 40 Caliber SIG P226. With that gun in a Crossbreed Supertuck holster and two magazines in the Crossbreed Supertuck magazine holder, I’m comfortable all day whether standing or sitting.